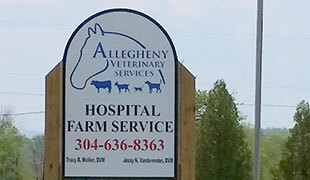 Allegheny Veterinary Services is conveniently located just north of Elkins, WV. We have prepared the following directions to assist you with finding our location. Please note that our services are available 24/7. If you are bringing in an animal with a life-threatening emergency, please call ahead. We offer routine appointments, surgery, nutrition counseling, emergency care, and many additional services at our fully equipped facility. Driving Directions: From Corridor H (US 48, US 33), Take the Elkins Exit. Proceed toward Elkins. Turn LEFT onto Old US 219 North (at Central Supply). Proceed 1.5 miles. The entrance to Allegheny Veterinary Services will be on your LEFT (in Gilman, Leadsville). Where is the Closest Veterinarian Near Me? If you are in Elkins, WV, or the surrounding area, Allegheny Veterinary Services is the closest highly qualified veterinary service provider and animal hospital near you. If your companion animal requires a routine immunization, flea and tick control, spay, neuter, or other surgical procedure, or any standard or emergency medical care, AVS is here for you. We care about our patients!